Saltmarshes are found in sheltered environments such as embankments, estuaries and the leeward side (the side sheltered from the wind) of barrier islands and spits in temperate regions of Australia. In the tropics and sub-tropics they are replaced by mangroves. 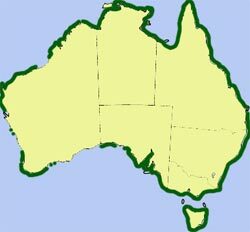 The area of saltmarsh/salt pan habitat in Australia has been estimated to be almost1.4 million hectares.